Browse: Home » What’s There To Do Around Here? This is an opportunity to create relationships with your guests! 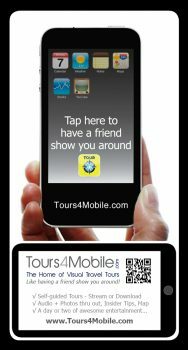 Just show them Tours4Mobile: walking tours on your phone. Much more than an audio guide, it’s like a friend showing you around! The display card provides links to local guide in the app stores. Perfect for independent travelers, 24/7 satisfaction. Customized with your business name and contact info (optional). Includes QR Code and URL for tracking all sales generated by your customers, for any tours they purchase throughout the year, so YOU earn commissions.